From the fall of the seven-year military dictatorship to the end of the Cold War (1974-1990), Greece has experienced almost two decades of unprecedented politicization and robust mobilization, among several other grievances. Calls for national sovereignty and democratization and growing opposition towards capitalism, NATO and the EEC mobilized Greek citizens to develop a culture of social and political protest which reflected in increasing political participation. Political parties, trade unions, and social movements eagerly accommodated this trend which was also an outcome of political suppression during the Junta, when protest movements swept both Cold War camps in Europe as well as the USA. The legacy of the civil war and the radicalization caused by the Junta and the Cyprus crisis of 1974 cemented the left’s ownership of social movements, in both its communist and centre-left manifestations, as well as the antagonism between them. However, in the early 1990s, the dispute with FYROM interrupted the leftist hegemony, as an almost cross-cutting partisan consensus that brought nationalists of the centre left together with the right and the far­ right into the streets. The leftist protest agenda was further challenged in 2000, when the people of the church, mostly conservatives, populated the streets to protest against the optional registration of religion in national identity cards. Ina broader sense, the agenda of mobilization in the 1990s and the 2000s was marked by the altemation between materialist and postmaterialist values: school and student movements, anti-war protest, opposition to pension reform, anti-globalization and environmentalist demands. The centrality of parties in social mobilization defined both the development and the research of social movements for the period under discussion. The peaceful protest which followed the deadly fires of 2007 seemed to bring a new kind of massive and spontaneous civil society reaction to the fore. Another transformation, including widespread civil violence, became evident in the riots that followed the murder of Alexandros Grigoropoulos by a policeman in December 2008. A few years later, the economic crisis, with its unprecedented magnitude and durée, brought massive, often violent protest to the forefront of politics. Anti­ elite, anti-parties, anti-austerity, anti-immigrant, anti and pro-EU movements, protest for local interests, environmental causes, composed an explosive new mosaic of protest, with ethnopopulism being the common denominator. The agenda of protest and indignation during the financia!crisis has multiplied academic and popular attention for social movements in Greece, without however having provided an integrated interpretation for the development and significance of the phenomenon, its continuities and discontinuities throughout the post- 1974 era. 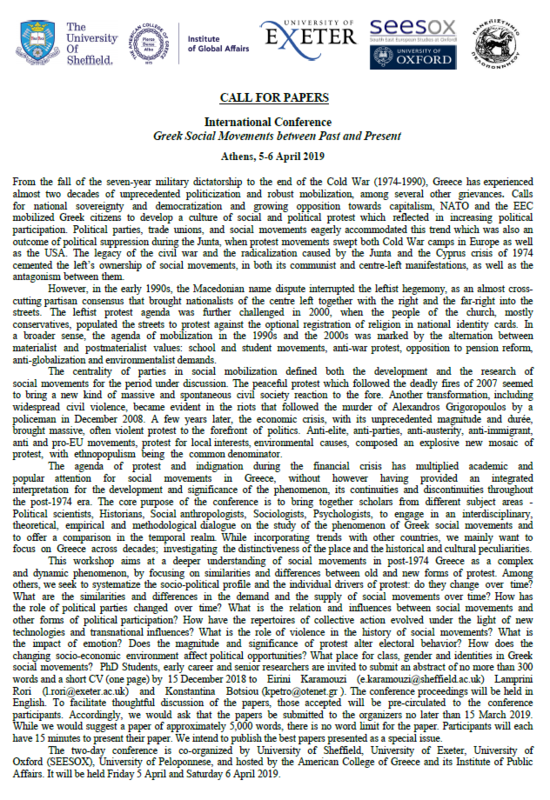 The core purpose of the conference is to bring together scholars from different subject areas – Political scientists, Historians, Social anthropologists, Sociologists, Psychologists, to engage in an interdisciplinary, theoretical, empirical and methodological dialogue on the study of the phenomenon of Greek social movements and to offer a comparison in the temporal realm. While incorporating trends with other countries, we mainly want to focus on Greece across decades; investigating the distinctiveness of the place and the historical and cultural peculiarities. This workshop aims at a deeper understanding of social movements in Greece as a complex and dynamic phenomenon, by focusing on similarities and differences between old and new forms of protest. Among others, we seek to systematize the sociopolitical profile and the individual drivers of protest: do they change over time? What are the similarities and differences in the demand and the supply of social movements over time? How has the role of political parties changed over time? What is the relation and influences between social movements and other forms of political participation? How have the repertoires of collective action evolved under the light of new technologies and transnational influences? What is the role of violence in the history of social movements? What is the impact of emotion? Does the magnitude and significance of protest alter electoral behavior? How does the changing socio-economic environment affect political opportunities? What place for class, gender and identities in Greek social movements? PbD Studeuts, early career and senior researchers are invited to submit an abstract of no more than 300 words and a short CV (one page) by 15 December 2018 to Eirini Karamouzi (e.karamouzi@sheffield.ac.uk) Lamprini Rori (l.rori@exeter.ac.uk) and Konstantina Botsiou (kpetro@otenet.gr). The conference proceedings will be held in English. To facilitate thoughtful discussion of the papers, those accepted will be pre-circulated to the conferenre participants. Accordingly, we would ask that the papers be submitted to the organizers no later than 15 March 2019. While we would suggest a paper of approximately 5,000 words, there is no word limit for the paper. Participants will each have 15 minutes to present their paper. We intend to publish the best papers presented as a special issue. The two-day conference is co-organized by University of Sheffield, University of Exeter, University of Oxford (SEESOX), University of Peloponnese, and hosted by the American College of Greece and its Institute of Public Affairs. It will be held friday 5 April and Saturday 6 April 2019.